← Welcome Amateur Gourmet Readers! I returned last night from a brief trip to New York City to reunite with friends I met while studying abroad in Beijing, who you can see in this post. New York is a whole different animal than DC. With low buildings and wide streets, Washington DC looks and feels like a flat, small dwarf compared to the frenzy and height of New York. Which got me to thinking: now that, for the first time in human history, the majority of us live in cities, what qualities would the ideal city have? scientists have begun to examine how the city affects the brain, and the results are chastening. Just being in an urban environment, they have found, impairs our basic mental processes. After spending a few minutes on a crowded city street, the brain is less able to hold things in memory, and suffers from reduced self-control. But the density of city life doesn’t just make it harder to focus: It also interferes with our self-control. In that stroll down Newbury, the brain is also assaulted with temptations — caramel lattes, iPods, discounted cashmere sweaters, and high-heeled shoes. Resisting these temptations requires us to flex the prefrontal cortex, a nub of brain just behind the eyes. Unfortunately, this is the same brain area that’s responsible for directed attention, which means that it’s already been depleted from walking around the city. As a result, it’s less able to exert self-control, which means we’re more likely to splurge on the latte and those shoes we don’t really need. While the human brain possesses incredible computational powers, it’s surprisingly easy to short-circuit: all it takes is a hectic city street. This is the one-two punch of city life: It subverts our ability to resist temptation even as it surrounds us with it, from fast-food outlets to fancy clothing stores. The end result is too many calories and too much credit card debt. OK, so that is the bad news. But, Lehrer goes on to explain that even small additions of “green” in the form of trees, flowers, and parks can make a BIG difference by improving our ability to focus and decreasing cognitive distractions. And there’s more: cities remain hotbeds of innovation because they allow people to encounter and converse with all sorts of different people. 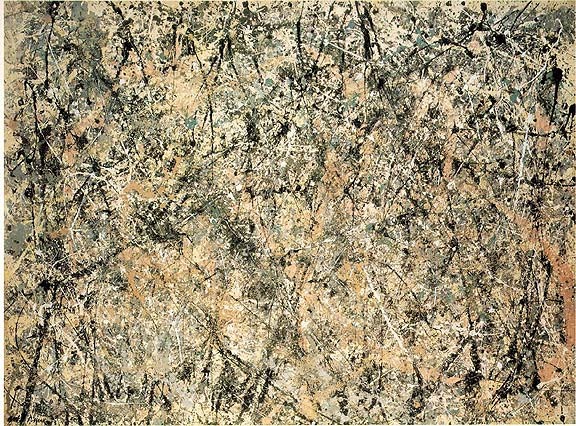 So, in the end, cities facilitate originality by clustering people–the quirks, bankers, bookies, physicists, dreamers, and yes, the poets–so close together that we inevitably bump into each other in the daily routine of life and the result is a chaotic, incredible splash of creativity. New Yorkers should be smiling. You have an enormous park smack dab in the center of your city and an enviable subway system: you combine the virtues of the countryside (less distractions=more ability to focus on creating) with the virtues of the city (bumping into nearly every shape, size, and flavor of human being while on the subway or the streets). Instead, you Angelenos are #1 on the Top 10 Worst Cities for Traffic of 2010. You are wasting time burning fuels when you could be debating about gerunds and participles. So, as the U.S. population gradually migrates from the Northeast to the Southwest, the urban planners of the ‘sunbelt’ have a tall task: build parks and build public transportation systems. The innovative capacity of the United States depends on it. *Read the full article by Lehrer here. Jonah Lehrer, “How the city hurts your brain,” Boston Globe, January 2, 2009. I think Chicago does well using this rubric. While not Central Park, our entire Lake Front that runs the span of the city is public park– with some very nice parks and forrest preserves that pepper the rest of the city and inner-ring of suburbs. Chicagoans would not call their public transportation “stellar” because of service cuts and ever growing fares– but I find it to be sufficient and really good compared to Seattle and L.A. I visited DC last summer and found the Metra to be comfortable and easy to use. The national mall and monuments create nice park space, but the rest of DC is certainly wanting more parks. What about Griffith Observatory and surrounding hills of nature??? Or Santa Monica/Malibu/endless CA coastline??? Just sayin…you can have both the mountains and the beach in the year-round 70-degree weather. NY and DC don’t offer that. Hey Kate!! Well I’ll yield to you on that one, since you are know Los Angeles much better than I do. 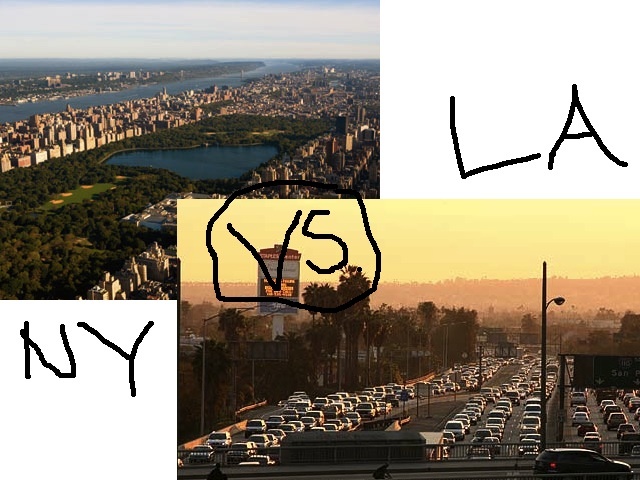 Maybe I should change the title to New York vs. Phoenix, but LA is shorter to write haha. I had to laugh when I read that phrase about knowing you were not in DC. If I heard someone mention gerunds in a cafe, I would definitely know I was NOT in Hilo. We live in the country for all your above mentioned reasons, and try to connect via the internet for the others. Thanks for the comment! Yeah at first I thought they were having a fight about something pretty serious behind me, but as the conversation progressed, I realized it was just one extended debate about grammar. It sounds like you have a good balance between the two–I grew up in the suburbs of Tacoma, Washington, and the one thing I disliked the most was having to drive everywhere and rarely strolling on the streets. Santa Monica Mountains National Recreation Area, Los Angeles 154,095 acres > Central Park, NYC 843 acres. Said another way, the park for Los Angelenos is 184 times bigger than the park for New Yorkers. The SMMNRA is natural. Central Park is artifical, sculpted, controlled by flunky bureaucrat park workers.